Just a quick email to let you know that we are taking PRE-ORDERS for the Airsoft Innovations Tornado Grenade. We are the exclusive distributor for Airsoft Innovations products, so check ’em out now! 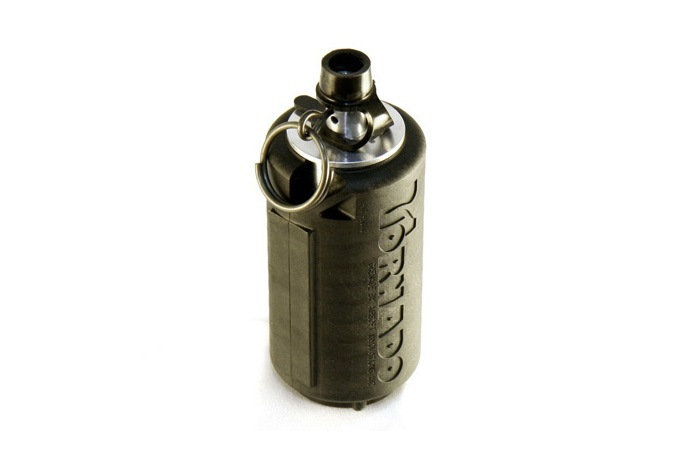 Airsoft Innovations Tornado Grenade A Green Gas -operated (propane) grenade with power, spread and simplicity never seen before in an Airsoft grenade. Pull the pin, toss and get a 360° cover with 180 BBs. Durable construction and no loose parts means you can use it over and over again, and you only need to mind your fellow players – not the grenade – when you frag a room or bunker. This product is fresh on the market, but already thoroughly tested and every independent review is giving two thumbs up and five stars for it! The Airsoft Innovations Tornado Grenade is designed and made in Canada, and we are proud to carry such a fine item in our selection. RedWolf Airsoft is the Exclusive Distributor for AI products in Hong Kong and the United Kingdom. The Tornado Grenade is the most reliable and effective Airsoft grenade we have seen to date, and the careful development with players has refined it into a guaranteed hit! (Pun intended.) The videos shot with special equipment tell you more than a thousand words of the performance, so do watch them to see how it works!